I don’t know what the time was but it was still dark, even had I not been wearing the eye mask, and I heard a shuffling by the side of the bed. Hurriedly pushing the eye mask up to my forehead I could make out a man in the gloom, reaching for my bedside table. It’s lucky I can’t scream or I would have woken half the resort but as it was I just sharply drew in my breath and then David spoke. It seems my mobile phone had been flashing and he was trying to find it to see what the problem was. Well it took quite a while for my heart to slow back down to normal I can tell you! Once it was time for normal people to peacefully awake there was an exercise class that I wanted to attend before breakfast so we went along to the main theatre area and I joined the pushing throng to get the equipment. We each had a pilates ball which we sat on a large plastic dog bowl to stop it rolling away and also had a pair of drumsticks each. The class was called Tribal and we did an assortment of low-impact moves, bashed the drumsticks together, or onto the ball, or waved them in the air in time to the music. I enjoyed the music very much and the class was fun, if crowded. Breakfast was good. I think it was the same every day but the choices were many. Pancakes with maple syrup, tiny croissants, 2 kinds of sweet pastry, eggs boiled, scrambled, fried (sunny side up or over easy), bacon, mini sausages, hash browns, grilled tomatoes, baked beans, spaghetti, sandwiches (which always had meat in them! ), assorted fresh fruit (apples, oranges, grapes, sliced melons), cereals, yogurt, toast with jam/marmalade etc, cool drinks, orange or apple juice and a huge variety of teas or coffee. There was something that sat on the right of the hash browns every morning that neither David nor I can remember so I can’t tell you about that dish, and some days there was a chef making omelettes to order. We think that was about all that made up the sumptuous spread but nobody can complain about that lot! 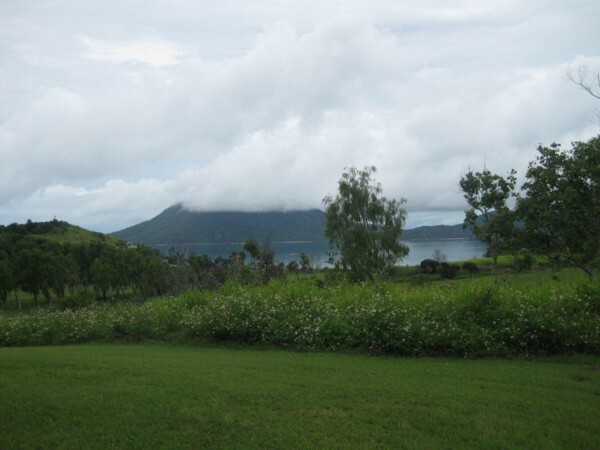 There were five posted nature walks around the island and we decided we would do the walk to the top of the mountain today. We set off for the climb up to reception and the steep path and steps beyond as far as the archery where we met someone on the path who told us that the route ahead was extremely muddy. Unperturbed we continued on, with the opinion that we’re not as woosy as most, and had to walk along a walkway made of planks raised over some wetlands. The planks were wet and as slippery as ice and we caught one another from falling several times. At the end of the walkway was a huge patch of very wet mud with a few blades of grass sticking out of it. Hmmm. Perhaps we should believe our informant after all, but we tip-toed across it only to be met by an area of grass that was up to the top of its blades in water. There was no way to skirt this because of the trees and we were forced to admit that we were as woosy as most and retreated back the way we’d come. Now what to do? We explored around the archery area where we were shooed away because it was Kids Club time, not adults, (there were no children there!) and this was when we discovered that the gym was but an empty hall. Further on from here was the adults only swimming pool, a beauty spa, the other side of the tennis courts and the ‘10th hole’ golfing shop so we decided we’d play a round of golf. The golf course was deserted and we would be able to make fools of ourselves in peace, not having touched a club for over 30 years in my case and a good 10 years for David. We were given a bag with some clubs in and the G.O. added some left-handed clubs for me and then we had to buy the golf balls at $3 each. We decided on 4 balls which were charged to our room and David strapped the bag onto a buggy. Off we went, full of innocence, to the first tee. Luckily, our only intent was to have some fun because we both estimate that the first hole took us about 20 hits. That’s each! So we wrote that down on our score cards! The grass between the tee and the green was very wet but we proceeded happily to the second tee. The ground here was wetter still and with every step, the water came out of the ground as our shoes made contact with it. Here’s evidence of the muddy wet that greeted our footsteps and the wheels of the buggy. Our golf skills happily improved fairly quickly until, by the third hole, David gave his ball a decent whack. We watched it land in the distance, heard a faint sound, and the ball shot off into the left-hand scrub. We took note of a landmark and set off towards it with me having the 3 shots I needed to get to the same point. Because the ground was so sodden, once a ball landed it just stopped dead, there was no rolling at all. 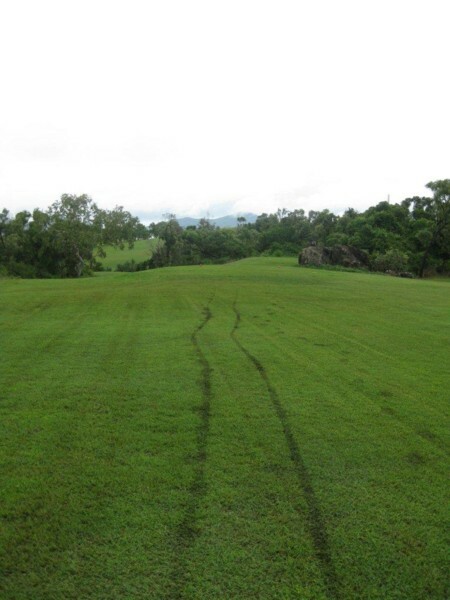 When we arrived at where David’s ball had exited stage left we found an embedded rock in the fairway. Someone had kindly marked it with white paint, perhaps attracting golf balls to it all the more but, search as we may, we could not find David’s ball. Nor any other because, theory would suggest, that we were not alone in losing a ball in that spot. On the very next hit he lost another ball so now we had no spares at all and I was hitting very short hits, partly through lack of skill and partly in an attempt not to lose another. A man came by on a quad bike and asked what on earth we were doing because the ground was far muddier ahead and he was apparently surprised that we’d been allowed out to play! Here’s part of what ‘ahead’ looked like though the photo is far tamer than reality because you cannot see the water in the rest of the grass. 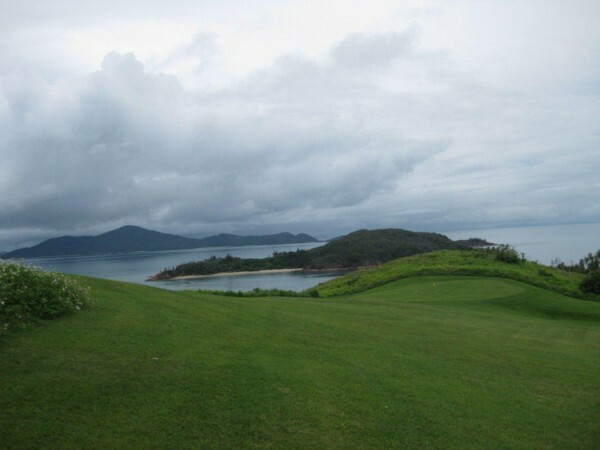 All along the edges of the fairways was lush green and fluttering around were what appeared to be glass-wing butterflies. I kept stopping to admire them and trying to photograph them; after all we were not holding anyone up! David used a wood for his second shot and it made the most wonderfully resounding hollow thwack sound, exactly as you’d hear from the professionals. We were both looking ahead to see where it had gone but I couldn’t see it. I turned to David as he turned to me, both of us with blank faces and as we started to wonder aloud as to where it had gone we both glanced downwards. There was David’s ball, sunken into the mud next to his feet. How it had remained there after the perfect sound of the hit will remain a mystery forever but we both cracked up laughing. By now our shoes were as mud-covered as if we’d taken the mountain path in the first place but it had happened gradually which I find easier than just treading straight into mud on purpose! And yes, it did get worse. 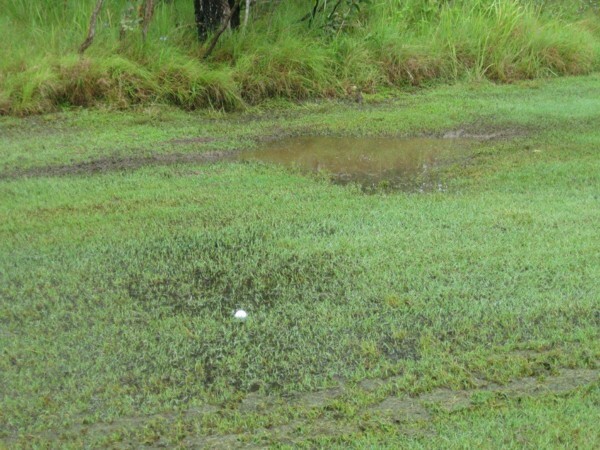 Here’s my ball, semi-submerged in water on a fairway around the 4th or 5th hole. 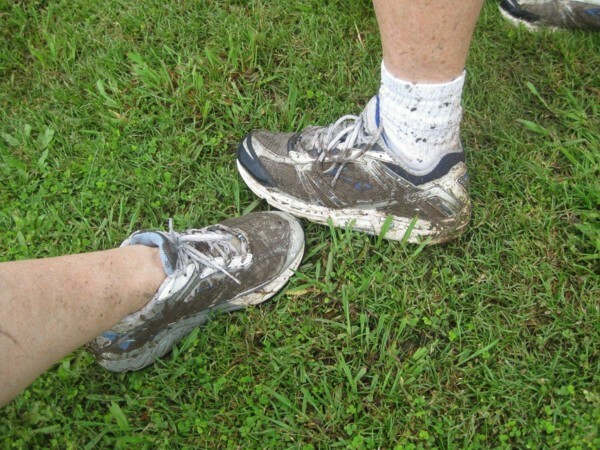 By now we both had mud spattered up to our knees and beyond, and were laughingly accepting of our fate. The rain held off so we were only wet from the bottom up, not the other way around, but we now knew exactly where the water came from to supply that waterfall near reception! The golf course!!! What had been white sports shoes! On the 6th hole I lost my ball off to the right and we couldn’t find it but I was happy to stop anyway. We’d long since given up counting our shots – that was given up half way along the 3rd hole. I don’t think golf score cards were made for 3 digit numbers anyway! So David continued to play with the last ball until the 7th hole where he tee’d off with a great shot and the ball sailed over the hill out of sight. Amazingly, after about a 10 minute search, we found it – or someone’s anyway, he took another shot and that was the last we saw of our 4th ball. Oh well, we’d had fun, and we decided not to shortcut back to the 10th hole but to walk on and see the remainder of the course. We were surprised to see another couple at the end of the first hole. They had a small child in tow and were rummaging in the bush looking for their ball. We smiled and called out a hello, made sympathetic noises about the ball, and kept our mouths shut about the conditions ahead. That would be their adventure as it had been ours. The view was certainly lovely anyway. A few steps from the green of the 9th hole I found a ball in the grass. Too late now so we brought it home as a souvenir! Making it back to the 10th hole we found it locked up so all we could do was leave the golf clubs outside the door and wondered what on earth to do about the state we were in. We went and looked at the swimming pool, expecting change rooms and a shower but there were none. I saw a lady in the beauty spa and asked her and she said there was a hose around the back of the building so we hosed ourselves down thoroughly and I got changed into my bathers – David was already wearing his – and we gingerly got into the chilly water of the pool. We had a nice little swim but didn’t stay long because it wasn’t very warm and we hadn’t traded our pool towel cards for actual towels so we just air dried on our way back to our room. Lunch had been hard earned and was suitably appreciated by the pair of us. After this we headed up the hill once more intending to wait until 3.30 to play archery (if ‘play’ is the right word) and we came across a French couple that we’d spoken to the previous day. They asked if we’d seen the bats and we replied no. 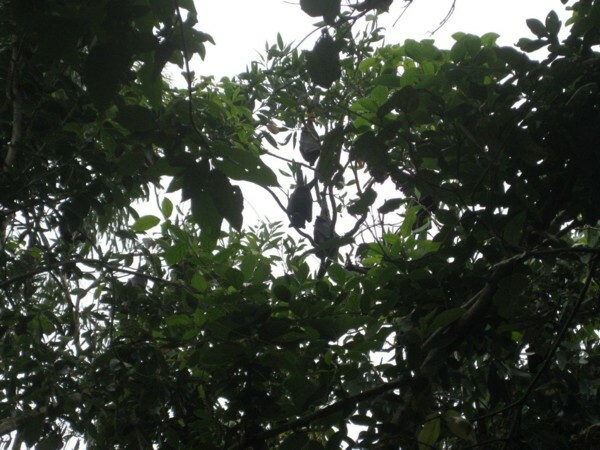 They walked us onto the slippery plank walk and pointed out the bats in the trees that were alongside. We were so surprised! We then realised that some of what we’d taken to be bird call was actually bat noises but we’d been too busy watching our step to look up into the trees the day before. Glad I’m not the only one who doesn’t know where Whitsundays are!!! Whitsundays..a place?? I always thought Whit Sunday was a date! Oh crikey that was…. 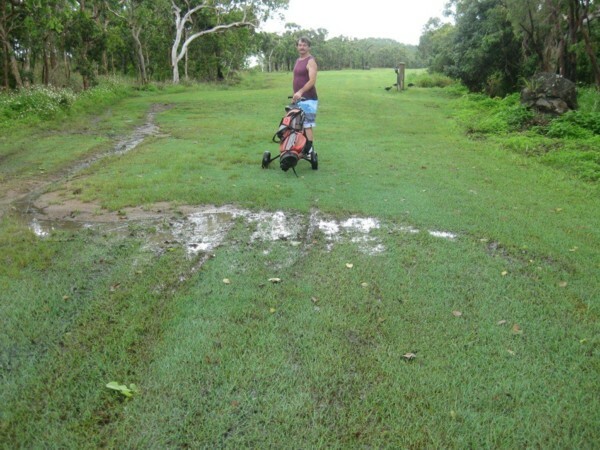 soggy golf course!